This elegant, five-guestroom log home is as beautiful and inviting as its backdrop, the legendary Grand Teton mountain range. The 6,000 square-foot home built in 1995, is entirely composed of huge pine logs, many salvaged from the great fire of 1988 in Yellowstone National Park. The open, slate entry leads into a massive, three-story living area that showcases a floor to ceiling 30 ft. river rock fireplace, a baby grand piano, and an adjacent library. The warm and inviting dining room features hand-painted tables and cheerfully eclectic Western decor. 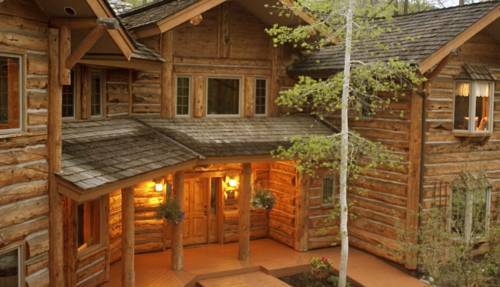 A stately log staircase leads up to the guest rooms off the open landing. A large cedar deck runs across the back of the Bentwood, where guests gather in friendly clusters at the end of the day to enjoy complimentary beer, wine and hors doeuvres and a view of the sunset over the spectacular Tetons.Bentwood offers guests all the comforts of home and more - including your own personal whirlpool bathtub, a fireplace in every room and the very finest in amenities. Each morning Bentwoods guests awake to the enticing scent of fresh baked muffins and fresh ground coffee. A robust breakfast is served with a different entree each day, such as German Apple Pancakes, Huevos Rancheros, or Egg Souffle all accompanied by country ham or bacon, fresh fruit, fresh squeezed orange juice, cereal, muffins and yogurt. Check-in is at 3 00 PM. Guests planning to arrive before or after this time must contact the property at least 48 hours prior to arrival to receive special check-in instructions. As a bed and breakfast property, the Front Desk hours will vary guests should contact the property to find out more information. To contact the property, use the number on the reservation confirmation received after booking. From Salt Lake City take I15 North to I80. Go east on I80 to Evanston, WY, then North on Rt 89 to Jackson Hole. On Rt 22 turn west. Cross the Snake River and turn North onto Rt 390 Teton Village Road - The Bentwood Inn is the first house third mile on the west side of the street set back from the road in a grove of trees.